Absorbs all spilled human body fluids including urine, blood etc. The body fluids are transformed to a semi- solid state making it convenient to quickly gather and dispose the waste product. Has a refreshing and pleasing aroma. Reduces the risk of infection when gathering body liquids. 1 handy container rapidly absorbs up to 12.5 liters of liquid waste. The residue becomes nontoxic and can be disposed in minimum time and labor. Ideally suited for kindergartens, schools, rest homes, doctor's offices, rescue services, cabs, public transport systems, pet shops, restaurants and sports stadiums. 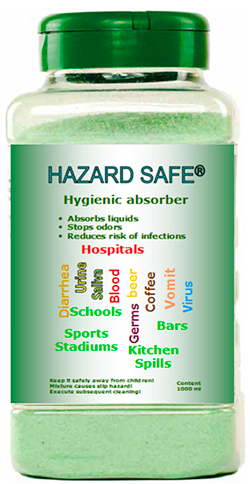 Hazard Safe is sparingly spread over spilled body fluids, until completely covered. Within seconds the waste is transformed to a semi-solid mass. This results in containing the bacteria and viruses. The residue can then be disposed off using a simple dust pan. This saves considerable time and manpower. The dry surface may then be disinfected. Keep the shaker closed and protect it against sun radiation and frost. Keep it safely away from children! Mixture may cause slip hazard! Hazard-Safe® designates a product group of Febbex International GmbH, Frankfurt, Germany.